About 5 years ago I was searching through my MIL's bookshelves to find something new to read when I came across a book called Deja Dead by an author I'd never read before, Kathy Reichs. I read the back cover and it sounded like a good way to while away some train trips. And it was. I really enjoyed it. Since then I've read all of Kathy Reichs Temperance Brennan novels. Anyway, 206 Bones is the 12th in this series and I must admit, while it was a good read, and better than some of the last ones, I think I may be a little over all the anthropology jargon which I just skim now. ...Back in Montreal, three more women have died, their bodies brutally discarded. Tempe is convinced there's a link between their deaths and that of the heiress. But what - or who - connects them? Tempe struggles with the clues, but nothing adds up. Has she made grave errors or is some unknown foe sabotaging her? It soon becomes frighteningly clear. It's not simply Tempe's career at risk. Her life is at stake too. The book starts with Tempe coming-to inside what she thinks is a tomb. Yes, a tomb. She struggles to remember the last thing that happened to her before she woke up and starts to panic when she realizes there may not be a way out. The book then jumps to the Office of the Cook County Medical Examiner in Chicago, where Tempe and her off-again boyfriend, Detective Andrew Ryan, are waiting to answer questions about the supposedly bungled autopsy mentioned on the back of the cover. The story is then interspersed with these small chapters where Tempe is stuck in the tomb and continues all the way through to the moment she ends up in the tomb. Something a little different for Reichs here, but it's really nothing new for this kind of fiction. The book plods along at an even pace, but you see the ending coming from a mile away and wonder why it takes Tempe so long to put two and two together. Overall, not one of the the best Tempe Brennan novels I've read. 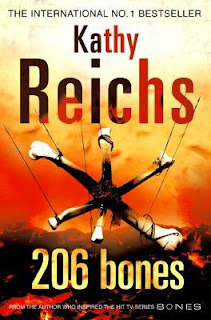 It seems a little tired, as if Reichs is just going through the motions, something I've been feeling for the last few books. I would definitely recommend reading the first 4 or 5 Tempe Brennan novels, but if you're a die-hard fan of crime fiction the more recent ones just aren't up to scratch. While I hate to do it, I have to give this book a thumbs down.